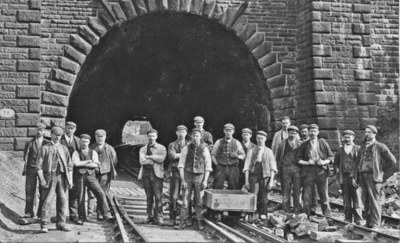 The image shows a group of workers posing at a tunnel mouth along with a stretch of LNWR narrow gauge railway. The short curving tunnel has plate 72 affixed to the left which may be enough to provide location and name. At the far and there is what appears to be a circular(?) stone structure. The Oldham/Saddleworth area has been suggested. Can anyone confirm this or suggest an alternative? Is it perhaps one of the tunnels under the Edge Hill gridiron? I do not recognise this as a Liverpool tunnel and especially not in the Edge Hill area. I suspect that the narrow gauge track is connected with work going on in the tunnel - there is some kind of platform under the roof. This would make it a temporary feature of the landscape and no guide to location. The stonework is very distinctive, but I cannot recall seeing anything quite like it. It could well be in the Manchester/Pennine area. I'm almost certain that this is the north portal of Barmoor Clough Tunnel on the Stockport to Buxton line, between Chapel-en-le-Frith and Dove Holes. The portal appears almost to match E.R. Morten's photo of May 4th 1953 (page 49 of The Buxton Extension by J.M. Bentley & G.K. Fox, Foxline) except that the facework between the pilasters appears to be brickwork in Morten's more-distant view; perhaps this was re-constructed as part of the works which appear to be taking place here? Note the iron tie bars at five-to and five-past on the arch suggesting structural problems! D. Ibbotson's view, on page 46 of the same volume, showing the Southern portal of the much longer Eaves Tunnel, a few hundred yards to the north, is almost an exact stylistic match. The main clue is the background through the tunnel; this appears to be the bridge abutment of Meadow Lane at its acute meeting with the A6 just south of the A623 junction. The only slight fly in the ointment is the point in the foreground though it's just possible in Morten's view to make out what might be a catch point in the same location; logical given the gradient. Alternatively, was there at this time a connection to the adjacent Peak Forest Tramway? In quickly referring The Buxton Extension I should mention the captions which confirm Barmoor Clough Tunnel as being no. 72, as per the picture, with the Meadow Lane bridge beyond as no. 73; that rather settles it, I suspect!